No matter what your stance is on gun ownership, and regardless whether you actually have a gun in your house, it’s important to talk to kids about guns. Kids have a natural curiosity about firearms and without appropriate education, their ignorance could be deadly. On average, 19 children are killed or receive emergency treatment for gunshot wounds every day in the United States. Firearms are the second leading cause of injury-related deaths in children ages 1 to 17. It’s estimated that one-third of Americans own a gun. So the likelihood that a neighbor, friend or family member has a gun, possibly unsecured, in their house is pretty high. It doesn’t matter how smart you think your child is at recognizing danger or if you don’t believe she would ever go exploring in someone else’s house. It means little that your firearms are always locked up—even if the ammunition is separate—or that hunting and target practice are an integral part of your family’s culture. The best way to avoid firearm-related accidents is to talk to your kids about guns over and over again. Holding regular conversations will remove the mystery and help them understand what guns are, how they work, and how they can keep themselves safe. Unfortunately, many parents trust their children to never touch a gun after they’ve been warned about gun safety. But multiple studies have found that even when kids have been told to never touch a gun, they are likely to touch a firearm when an opportunity presents itself. And the consequences can be fatal. So while talking to your preschoolers and elementary schoolers about guns is vital, your child is still at the age where you need to do much of the work for him—and that means talking to the adults in the homes that you visit to find out if there are weapons in the house. It might feel like an awkward conversation to have, like you’re accusing them of running an unsafe household, but try to move past that—it’s all in the name of your child’s safety. In fact, another adult will likely appreciate that you’re bringing up such an important subject. In a matter of fact manner, say something like, “Before I let my children loose in your house, I just want to find out whether there are any things they could get into. Do you have any guns in your home?” If they do, insist that all firearms be unloaded, locked securely, and inaccessible to your child. But, of course, this can’t be your only line of defense. 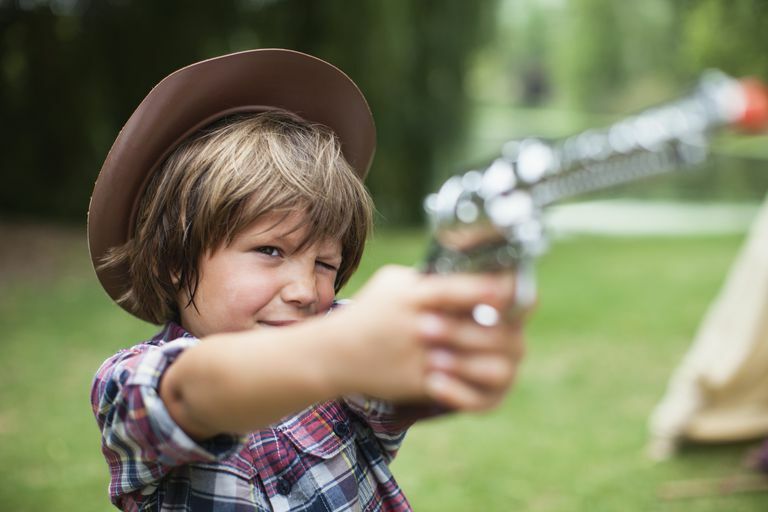 Little kids—particularly little boys—naturally have the impulse to pretend to shoot with guns, and research shows that children as old as 12 have a difficult time distinguishing between real and play guns. Therefore, it’s never too early to talk to your child about what to do if they come across a firearm. Start by showing him photos of various types of guns, so he knows how to identify them. Explain that if he ever comes across one—even if he thinks it might just be a pretend gun—that he should immediately leave the area and find an adult. Push the point home by quizzing him. Ask questions like, “What would you do if you saw a gun on a table at your friend’s house?” Offer heaps of praise when he answers correctly. As your child gets older, expand the conversation. Discuss the difference between the use of guns in TV shows and video games, emphasizing that they’re make-believe situations, and what can happen if someone is actually shot—they don’t regenerate a life and get back up. Once your child is in middle school, he will have likely heard about at least a few incidents of gun violence around the country—or potentially in your own community. Use the news as a jumping off point to keep the dialogue open about how dangerous guns can be. Continue talking about the importance of not touching guns, especially if he finds a gun in someone else's home. Make it clear that although your child may think he knows how to handle a gun safely, picking up a firearm could have deadly consequence. Your child also runs the risk of having a friend who wants to show off the weapons that are in his house. Standing up to friends is a delicate subject, so brainstorm ways your tween can get out of the situation without causing any commotion. Your child doesn’t need to preach or lecture friends about gun safety. She just needs to remove herself from the situation. If you allow your child to hunt or to own a BB gun, make sure you are actively involved in teaching him safety basics. And create a clear rule that says he isn't allowed to use them unless you are supervising him. While in some areas of the country, teens are toting rifles to go hunting after school, in other areas, teens are carrying guns to intimidate others. Regardless of where you live or how guns are viewed in your community, it’s important to hold regular conversations with your teen about gun safety. Teenagers can be impulsive so even if your teen knows how to handle a gun safely, a split second decision is all it takes for an injury to happen. So it’s important to keep guns locked up even if you think your teen would never touch your firearms. It’s also important to bring up the issue of gun violence in school. Talk about what to do if another student brings a gun to school—namely, tell a teacher, guidance counselor or principal as soon as possible. It’s worth mentioning that she can always tell an adult if another student simply suggests or threatens to bring a gun to school. Remind your teen that, by doing this, they could save lives and prevent a tragic situation. Talk about any safety concerns your teen may have as well. Ask if there are times when she is afraid that someone may bring a gun to a party or that someone may have a gun at school. Talking about your teen’s concerns and helping her develop a plan that will keep her safe can calm some of her fears. Violent media: Many video games and movies romanticize gun violence. So carefully consider what your child is watching. Monitor your child’s media consumption and limit the amount of violence your child is exposed to. Storing a gun: If you own a gun, keep it locked up. Don’t simply hide it in a ‘secret’ place because there’s a good chance your child will eventually find it. Do hide the keys to the gun cabinet, however, and never leave your gun unattended when you’re handling or cleaning it. Guns and violence aren't easy topics to discuss with your child, no matter what his age. As a parent, you want to protect your child from all the scary things that are out there in the world. By keeping the conversation open about guns, though, that’s exactly what you’re doing—protecting your child. Brown A. Among U.S. gun owners, parents more likely than non-parents to keep their guns locked and unloaded. Pew Research Center. June 2017. Fowler KA, Dahlberg LL, Haileyesus T, Gutierrez C, Bacon S. Childhood Firearm Injuries in the United States. Pediatrics. 2017;140(1).